When New Horizons left Earth nine years ago, its destination was still being taught to schoolchildren as one of the 9 planets in our solar system. The spacecraft’s final destination of Pluto has since lost its planet status, but that doesn’t make its upcoming arrival at the mysterious dwarf planet any less exciting. The plutonium-powered probe — roughly the size and shape of a grand piano — is heading for a flyby 6,200 miles from Pluto’s icy, unexplored surface on July 14, 2015. But scientists plan months of increasingly detailed observations of Pluto before then, beginning in January with long-range imaging to help navigators keep New Horizons on course for the make-or-break encounter. 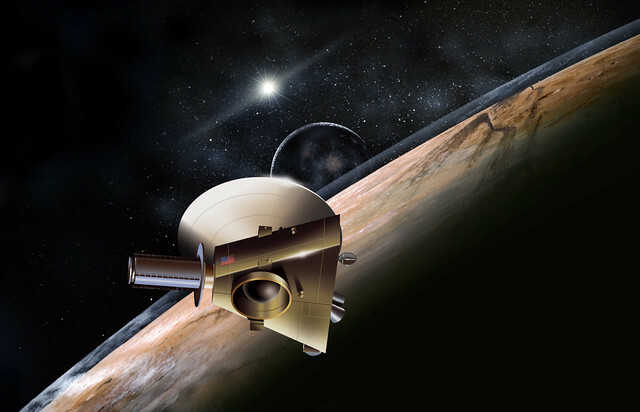 The mission marks the first visit outside Neptune’s orbit to the Kuiper belt, which consists of Pluto and thousands of objects that have not yet been identified. New Horizons is currently 2.9 billion miles from earth and was launched in January 2006 atop an Atlas V rocket. The spacecraft has over the last nine years frequently gone into hibernation for various amounts of time ranging from 36 to 202 days, which adds up to five years of total hibernation, to help conserve power and allow scientists time to make plans for its exploration in space. It transmits a beep once a week to alert scientists that it is still functioning properly. Once awakened on Dec. 6, New Horizons will transmit radio signals that will reach the mission’s control center, located at the Johns Hopkins University Applied Physics Laboratory in Maryland, in about four hours at 9 p.m. eastern time. Scientists plan to use the next six weeks after it wakes to check its memory, navigation and other functions. They will start the observation phase in January, with the spacecraft taking photos and measurements of the dwarf planet and its moons while also observing its atmosphere and how it interacts with the sun. Until January 2015 no data is expected because right now the spacecraft is still 175 million miles away from Pluto. If things go according to plan, researchers will be starting to get information on the geology of Pluto by June.